Pierce zucchini several times with a fork. Place zucchini on a microwave-safe plate, and microwave for 2 minutes. Flip zucchini and microwave for 2 more minutes, or until softened. Pat dry. Let cool, about 5 minutes. Cut zucchini in half lengthwise. Gently scoop out and discard the inside flesh, leaving about 1/4 inch inside the skin. Thoroughly pat dry. 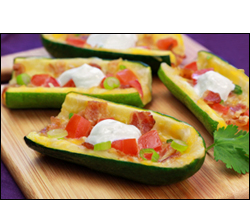 Place hollowed-out zucchini in the baking pan, cut sides up. Distribute cheese among the zucchini. Chop or crumble bacon, and sprinkle over cheese. 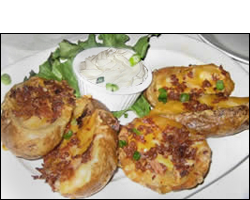 Bake until cheese has melted and bacon is hot, about 5 minutes. Cut each piece in half widthwise, and sprinkle with tomato and scallions. Enjoy! Click "Send to a Friend" to pass along this recipe to all your appetizer-loving buddies... Then invite 'em over! Today, March 5th, is National Cheese Doodle Day... despite the fact that the popular snack product spells "cheese" Cheez. Regardless, our current favorite cheese puffs are made by Snikiddy!